Traditions abound this time of year. From where we go to what we eat, from when we celebrate to how we decorate, and on and on. To me, traditions are one of the many things that make Christmastime so special. They're a link to our past, so often passed down from one generation to the next, and also a way to bond in the future and make memories for the future. I also think it's neat to hear other people's traditions and the stories behind them. So today I thought I'd share a few traditions that me and my family have. Things really get started on Christmas Eve. It was always so hard as children to wait ONE more day to open presents, so my mom would allow us to open one gift. She always gave us new PJ's on Christmas Eve. We plan to start that tradition with Emma this year, so you KNOW she'll be getting some new Christmas PJ's from Cloud 9! We always go to our church's evening service on Christmas Eve. After church, we head home for a delicious meal cooked by my mother. My grandmother always spends Christmas with us, too. She is 84-years-old. Emma is named after her. And we are so blessed to have her with us! We eat, drink, and enjoy time as a family. On Christmas morning we all hurry downstairs to see what Santa has brought for Emma. 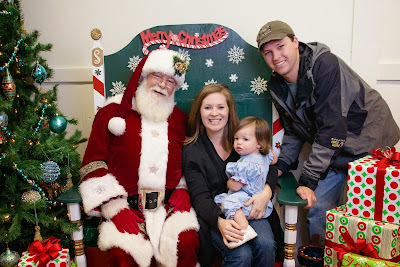 She will be 19-months old, and we are looking forward to a wonderful Christmas with her and seeing how excited she is. We'll enjoy breakfast as we exchange gifts with family. Warning: I may be about to make you (and myself) very hungry! Mom always cooks her famous breakfast pizza. She also has homemade biscuits with ham, homemade cinnamon rolls, and cheese grits. But her breakfast pizza is what we all look forward to. It's our tradition, and Christmas wouldn't be the same without it. We will probably spend the rest of the day watching Emma play with all of her new toys and hopefully grab a nap when she does! Then Christmas night, we'll have another dinner cooked by my mom, again. Thank goodness she LOVES to cook! So those are our holiday traditions. What are yours? Will you be starting any new traditions this year? In closing, I want to wish everyone a Merry Christmas, a safe holiday season, and a Happy New Year! Saturday, was a big day at Cloud 9, as we welcomed everyone's favorite North Pole resident for a visit. And we had a blast! The rain Saturday morning cleared out just in time so that Santa's sleigh was able to make an easy landing. We had milk and cider, plus delicious cookies and other goodies from Mel's Sweet Treats. I think I even saw Santa snag a few himself. Guess he really does like milk and cookies! 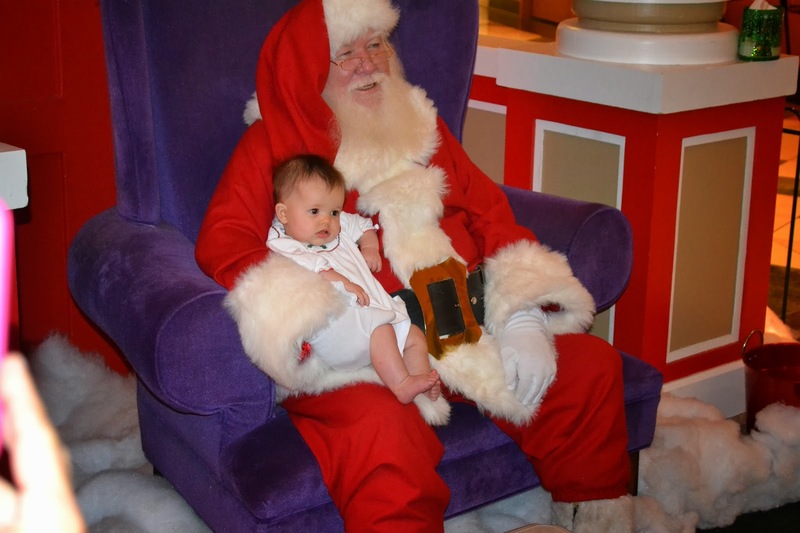 We had some visiting Santa for the first time, as young as 3 weeks old. And others who were so excited they talked about seeing Santa all morning, but when the moment finally came, they suddenly became shy, and maybe a little scared. That's OK. Emma didn't seem to like Santa all that much, either. I'm sure that'll change one day. We enjoyed catching up with friends while they were shopping and visiting with Santa, and enjoyed meeting lots of new friends, too. I want to thank each of you for coming out Saturday and making this event a success. Santa is probably back to the North Pole by now. It's his busy time of year, you know. But we hope he'll make Cloud 9 one of his regular stops in the future. Sometimes when you are ordering at a restaurant, you might ask the waiter or waitress, "What do you recommend?" So for this week's blog post, I thought it would be fun to share a few of the top gifts I would recommend from Cloud 9. Pete the Cat Saves Christmas book with Pete the Cat plush - We are big fans of Pete the Cat around here, and think your child will be, too. Checkout Register - Remember playing "store" as a kid? Register comes with money and a card scanner! For the little musician - Xylophone, Mini Maracas, Tambourine, or Drum. Shopping Cart - I know a little girl in our house that is getting one of these! (Wait, you're not reading this are you, Emma) Any of our wooden food sets or any of our plush foods would be a great compliment to this gift. Finger Puppet Book - Makes a great stocking stuffer! Old Maid or Go Fish playing cards - These are also good stocking stuffers. A to Z Uppercase Magnatab - Educational and fun! Bilibo - A rocking chair? A tunnel? A spinning top? See what your child turns this versatile toy into. Wonder Cleaning Cart - How awesome is this? Comes with a broom, mop, hand brush, and dust pan. Lawnmower Push and Pull Toy - Remember when mowing the lawn was fun? Actually, while I might be a little biased, I don't think you can go wrong with ANY gifts from Cloud 9 this Christmas. No matter what you get your child, I hope it turns out to be one of their favorite things. It always seems that once Halloween arrives, the rest of the year just flies. And sure enough, here we are at the beginning of Thanksgiving week already. Since I shared some of my Halloween memories last month, I thought it would be fun to share some of my family's Thanksgiving traditions, too. Our Thanksgiving Day begins with family morning time. My mom always makes breakfast pizza, so we will munch on that while watching the Macy's Thanksgiving Day Parade. Emma was only 6 months old last Thanksgiving. (This year, she'll be 18 months on Black Friday!) So I'm hoping she'll be able to enjoy the parade this year, and that she'll grow to love it as much as I do. I guess our main Thanksgiving tradition is cooking and over-eating! My family must believe "too much is better than not enough" because there is always way too much food. So as you can see, there's no need to worry about us, we will be well-fed this Thanksgiving. I think holiday traditions are wonderful. It's important to me to be able to pass those along to the next generation and maybe even start some new traditions of our own. And also to remember what this holiday is all about. This year, I am thankful for good health. I am thankful for friends. I am thankful for employment. I am thankful for all of the many wonderful people I've met and gotten to know through Cloud 9. And I am thankful for my family. I have no idea what I would do without the love and support of my family. I'm thankful to be able to spend another Thanksgiving with my 85-year old grandmother. Having a holiday, or any day, to spend with loved ones is priceless. May each of you have a happy and safe Thanksgiving. What are some of your favorite Thanksgiving traditions and memories? October is SIDS Awareness Month. Did you know that SIDS -- Sudden Infant Death Syndrome -- is the #1 cause of death for infants under the age of one? While much is still not known about SIDS, there are some steps you can take to help prevent it. One of the simplest, yet most important things you can do is make sure your baby always sleeps on his/her back. To help raise awareness of SIDS, Cloud 9 will partner with Decatur Morgan Hospital to begin a "This Side Up" SIDS Awareness Campaign in 2014. We will be hosting a Strike Out SIDS family bowling event to raise money to provide every infant born at Decatur Morgan Hospital with a "This Side Up" onesie. These onesies will have the words "This Side Up" on the front as a reminder to place the baby on his or her back when sleeping. The back of the onesies will have a list of other ways to prevent SIDS. In addition, Cloud 9 will be distributing rattles that all new mothers and babies will be sent home with to promote SIDS Awareness. -Control room temperature to keep your baby from getting overheated. -Offer your baby a pacifier for all sleep times. -Remove all loose toys from the baby's sleep area. -Don't smoke and do not allow others to smoke around your baby. -Breastfeed your baby, if possible. -Don't bring your baby into your bed. We look forward to partnering with Decatur Morgan Hospital in 2014 to help prevent and raise awareness of SIDS. What could be more important than doing everything we possibly can to protect those who rely so entirely upon us to do just that. 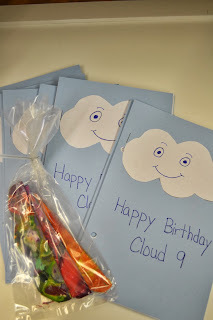 Cloud 9 turned three years old on October 15th. 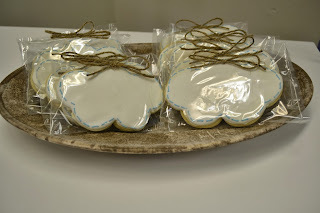 As you might have guessed, there were clouds everywhere -- cloud-shaped cookies, clouds on the birthday cake, and we even had cloud-shaped crayons and cloud coloring books that we made as party favors for the kids! Yes, we went all out. But hey, you only turn three once, right? 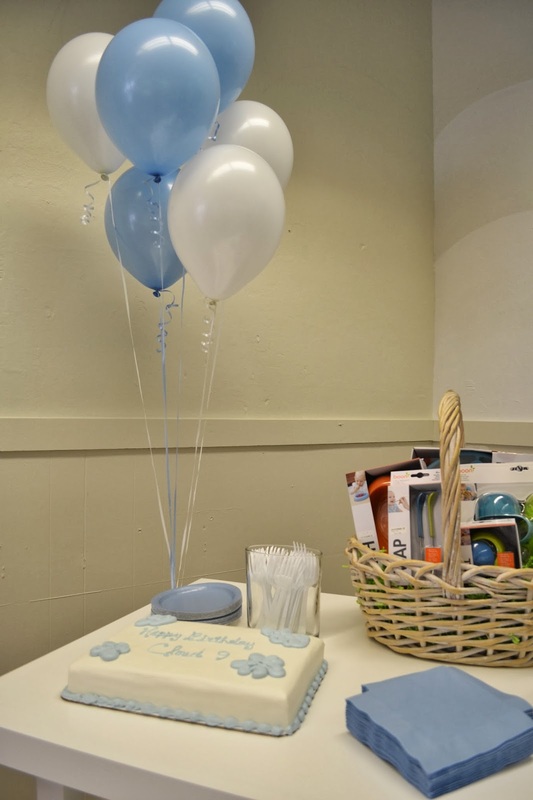 I want to thank everyone who stopped by to be a part of our celebration. Anytime anyone asks, I always say the very best part of my job in interacting with people. I have met so many wonderful people through Cloud 9. I have gotten to watch families grow and children grow up. It is a magical time in any family's life, and I am so blessed to get to be a small part of it. 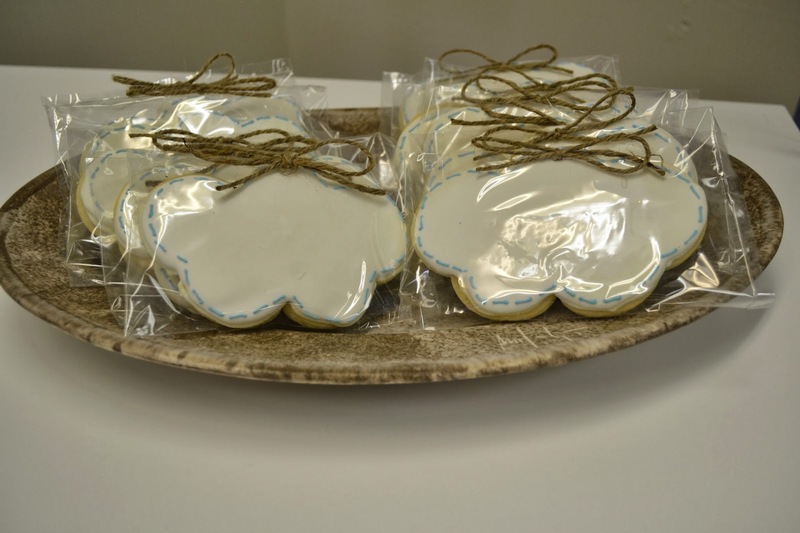 Cloud 9 was born on Bank street in 2010, though we were originally located in the 500 block, next to Tammy Eddy Antiques. We have always loved it here on Bank Street -- the history, the stately old buildings, and the delightful and unique atmosphere it all creates. We wouldn't want to be anyplace else! Something that is very important to us is giving back. Having a business gives us a platform, a larger voice than an individual. And being a children's store, helping needy children for Christmas seemed like a natural fit. This year, between our birthday (October 15th) and December 2nd, for every $100 spent at Cloud 9 (online and in-store), we will donate a new toy to the Neighborhood Christian Center which will benefit needy children in our community this Christmas season. The Neighborhood Christian Center is located right here on Bank Street, too. I chose to support the NCC because I believe they work hard to support the Decatur area, a community that has helped me grow Cloud 9 to where it is today. I want to thank each and every one of our customers for a wonderful three years! I am grateful each day for every single one of you. One thing's for certain: Without you, we wouldn't be here. Autumn has surely been in the air these last several days. Along with the cooler weather, October also brings one of my favorite holidays -- Halloween! My memories of Halloween include a bunch of us kids piled into the back of a Suburban and riding from one house to the next. Mom or Dad would open the back gate and off we'd go. Back then it was all about the candy. Now it's all about the kids. When I was little, my mom used to make our costumes. Uh yeah, I ordered Emma's costume from Pottery Barn. Apparently I didn't get the Halloween-costume-making gene. Emma will get to wear her costume to her school's Fall Festival, and we will be taking her to Bank Street Trick-or-Treat, as well as Trunk-or-Treat at church. We invite everyone to stop by Cloud 9 on Saturday, October 26th, from 10-2. We will have candy for the trick-or-treaters, and for the adults we'll have donuts and a cauldron of cider! I'm looking forward to seeing Emma and all the kids with their cute costumes and smiling faces. -Wear bright or reflective clothing, or use reflective tape for costumes and trick-or-treat bags. -Be sure to carry a flashlight. -Inspect your child's candy at the end of the evening for choking hazards or signs of tampering. Happy Halloween from Emma, and me! It's all good with Pete the Cat! Pete the Cat is just so groovy that he makes everything fun - whether its stepping in mud in our new shoes, strapping on our pack to head off to school, or even losing buttons on our most favorite shirt. That's why we dedicated a story hour just for him! We celebrated the release of "Pete the Cat and His Magic Sunglasses" on Tuesday, October 1st. We partied Pete-style with "cat food" (goldfish crackers) and juice. All children received "magic sunglasses" to take home! Parent Coach Carol Ozier was our guest reader. She came dressed in blue just like Pete! 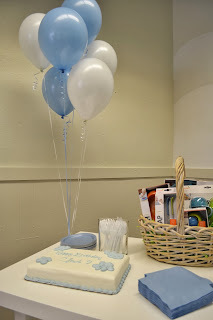 Thanks to all who attended our very first story hour at Cloud 9! Please enjoy the pictures and videos! Pete the Cat is back! Meet Pete, the groovy blue cat. He likes movin', groovin' and schoolin'. Pete the Cat always keeps his cool! If you haven't been introduced you are probably looking at this picture thinking what is the big deal?!? Well I was hooked after hearing his catchy little song. But there is so much more to Pete the Cat than his song. One of my favorite things from the books is the lessons we can learn from Pete. Pete never gets angry or throws a fit when things don't go his way--he just makes the best of it and keeps going. 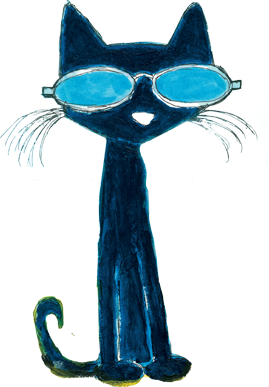 Pete the Cat is back in New York Times bestselling artist James Dean's picture book Pete the Cat and His Magic Sunglasses, written by Kimberly Dean. Pete the Cat wakes up feeling grumpy—nothing seems to be going his way. But with the help of some magic sunglasses, Pete learns that a good mood has been inside him all along. Fans of Pete the Cat will love watching him take his positive outlook and transform a grumpy day into an awesome day! We're pleased to invite you to celebrate the release of Pete the Cat and His Magic Sunglasses. Join us to party Pete-style with "cat food" (goldfish crackers) and juice. All children will receive a free pair of "magic sunglasses" to take home!